What does the Trump era mean for The City? 'Trumponomics' promises to change the mood in the US business sector. The City could benefit from upward pressure on US interest rates if this translates into more profits for banks. Some benefits could prove to be a mirage – the rebirth of fossil fuel industry is likely to fall victim to the strong trends now established in the costs of different technologies. With the arrival of President Donald Trump, Angus McCrone asks how 'Trumponomics' will affect the Square Mile. To judge by the London skyline, confidence in the future could hardly be higher. At night, the red warning lights on huge cranes dot the darkness, and during the day, construction work proceeds on yet more skyscrapers – notably the 912ft Bishopsgate Tower, which will be highest edifice in the Square Mile when completed in 2019, and an array of residential high-rises, including one of 722ft on the Isle of Dogs and one of 535ft on the south side of Blackfriars Bridge. Big and brash might seem appropriate in the new, Trump era. The mood among most City professionals, however, does not match that of its commercial property developers. Instead, there is anxiety about the loss of jobs and financial expertise – and the general economic damage – that might result from Brexit. However, The Donald has arrived and the UK’s financial workers may soon start to see their champagne glass as more than half full – at least for a while. Why? The long period of grinding recovery from the 2008 financial crisis has been hard and dispiriting for bankers and those working in the securities markets. 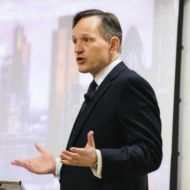 Regulations have been tightened to the point where 10–20 per cent of the staff in investment banks now work in compliance. Bonuses have been hit by tax raids. Volatility has been squashed by central bank quantitative easing policies, or “financial repression” as it is sometimes known. The gap between short-term interest rates and long bond yields has shrunk so much that banks have struggled to make money. High-profile flotations have been few and far between, and public interest in the stock market has been low. Trumponomics promises to change the mood in the US. Business will be unleashed. Regulations will be burned, including perhaps some of the 2010 Dodd-Frank Act clampdown on Wall Street. Environmental rules, such as those limiting CO2 emissions from power stations and those limiting future gasoline consumption in cars, will go. There is a whiff of Reagan in Trumponomics – notably the $500bn tax cut plan and the promise to “modernise” the US military. Trump even goes one step further, pledging to renew America’s crumbling infrastructure. In the City, the Reagan era is remembered as a good one, coinciding with Big Bang deregulation, the privatisation boom and the share mania of 1987. The markets have already decided that Trumponomics means higher interest rates – the yield on the US Treasury long bond climbed from 1.6 per cent in July to 2.6 per cent in mid-January. If Trump gets at least elements of his tax cut and infrastructure and defence spending plans through Congress, it would raise the US budget deficit and boost economic growth. Both are developments that are liable to add to upward pressure on interest rates. If that, in turn, means more profits for banks, then the City of London is well placed to benefit. There could also be crumbs left on the table for London-quoted companies as a result of higher US military spending in the shape of sub-contract work for UK defence contractors benefiting from the depressed sterling-dollar rate. A rehabilitation of Russia could also bring more share issues and fees to the City. Will it be a mirage? Not all of the Trumpian splurge would necessarily benefit the Square Mile. One spur to foreign takeovers by US multinationals in recent years has been that these corporations have had an estimated $2.5 trillion of cash stranded overseas; cash that if repatriated to the US would incur a 35 per cent tax charge. Trump has pledged to bring this money home, with the aid of a cut in the tax rate to 15 per cent. Some “benefits” of Trumponomics could prove to be a mirage. The rebirth of fossil fuel industry is likely to fall victim to the strong trends now established in the costs of different technologies – coal is losing out variously to gas, wind or solar in most parts of the world, and the internal combustion engine is facing an existential challenge from electric vehicles as battery prices plunge. Trumponomics could also run into trouble more quickly than Reaganomics did. US unemployment was 7 per cent early in Reagan’s term. It is 4.7 per cent now. There may be much less room for animal spirits to roar before inflation emerges. Also, a Trump trade war with China could trigger an international crisis that rebounds on London, via its role as a bridge to Asia. For the City, the only two certainties would appear to be a more cluttered skyline and volatile markets. This article first appeared in the February 2017 edition of CA magazine. 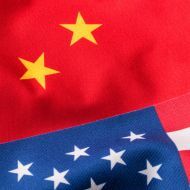 Main image editorial credit: Andrew Cline / Shutterstock, Inc.
Thumbnail image editorial credit: JStone / Shutterstock, Inc.
What is the future for US-China trade? Is banking approaching an 'Uber moment'?